Critics have hailed soprano Eudora Brown for her “warm, alluring voice” (CHICAGO TRIBUNE) and as a “talent to watch, with a dark, warm voice” (OPERA NEWS). Most recently, Ms. Brown thrilled audiences with her fiery interpretation of Irene in Wagner’s rarely performed Rienzi with National Philharmonic Orchestra under the baton of Piotr Gajewski. This past season, the soprano debuted as Liu in Turandot with Opera Hong Kong and appeared in scenes from Tannhäuser and Die Walküre in concert with the American Wagner Project. Ms. Brown also appeared with maestro Antony Walker and Washington Concert Opera for an evening of Richard Strauss and was heard in Berg’s Sieben Fruhe Lieder and Strauss’s Salome with the Wagner Society of Washington, DC. A Tanglewood favorite, Ms. Brown had the honor of being selected to perform Beethoven’s Choral Fantasy in collaboration with maestro David Zinman, pianist Peter Serkin and the Boston Symphony Orchestra for the Tanglewood 75th Anniversary Celebration, a performance that was broadcast nationally on PBS’s Great Performances. Other recent performances of note for Ms. Brown include Beethoven’s Mass in C and Chilcott’s Requiem with Washington, DC’s Choralis. Like many dramatic voices, Ms. Brown’s evolution into dramatic repertoire passed through performing a lower fach during her young artist years. Eudora first gained international attention as a mezzo-soprano in the role of Beatrice in Beatrice and Benedict with Santa Fe Opera. Assuming the role at the last minute, when the originally scheduled singer took ill, Ms. Brown through her proficiency convinced management to engage her for the entire sold-out run. Career highlights include Les Contes d’Hoffman and Salome with Dallas Opera (both under the direction of Graeme Jenkins), Handel’s Solomon, Rossini’s L’Italiana in Algeri, and Handel’s Joshua with Boston Lyric Opera, Agrippina with Boston Baroque, and Mercadante’s Il Giuramento with Antony Walker and Washington Concert Opera. A three-time Tanglewood fellow, Ms. Brown first triumphed at the festival in the US première of Jo Kondo’s Japanese opera, Hagoromo, and further appeared at Tanglewood as The Cat and The Squirrel in Ravel’s L’Enfant et Les Sortileges, with Robert Spano, and Phædrus in Satie’s Socrate, for a live NPR national broadcast. Ms. Brown created the role of Barbara in the New York première of Robert Ward’s Roman Fever. 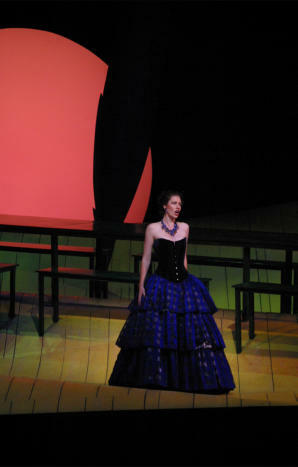 Her international debut came in Carmen, followed by Der Rosenkavalier at Teatro Mancinelli di Orvieto, Italy. Extremely accomplished on the concert stage, Ms. Brown recently performed Verdi’s Requiem with the Concert Artists of Baltimore, and Paray’s Mass at the National Cathedral. Further concert highlights include Beethoven’s Missa Solemnis and Symphony No. 9 at Tanglewood. Ms. Brown performed Bach’s Cantata No. 45 with Seiji Ozawa and Saariaho’s Chateu de L’Ame with Robert Spano and the Boston Symphony Orchestra. Additionally, she has performed Mahler’s Lieder eines fahrenden Gesellen and Brahm’s Neue Liebeslider-Walzer with the Boston Chamber Music Society, Mahler’s Urlicht, Schubert’s Ständchen, the Brahm’s Requiem, and Ancient Voices of Children with George Crumb.